Offering an integrated and switchable noise gate, the Behringer Vintage Tube Monster VT999 effects pedal has that full-tone roar of a tube engine under its hood. 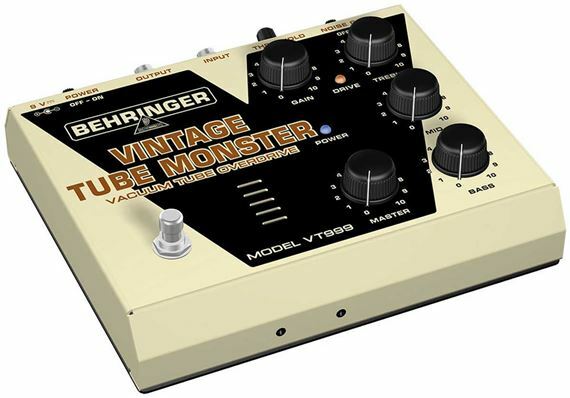 The Behringer Vintage Tube Monster VT999 effects pedal has that full-tone roar of a tube engine under its hood, letting you take off with anything from warm blues overdrive to heavy distortion. This high-quality stomp box has the warm sound of a hand-selected 12AX7 vacuum tube. In addition, the VT999 offers an integrated and switchable noise gate with adjustable threshold that keeps your sound noise-free. A status LED for effect On/Off is included, plus there is a true hard-wire bypass for ultimate signal integrity. With this monster engine, your guitar playing will definitely be kicked into monster overdrive! I decided to purchase this unit after reading a great deal of reviews online, most of which were positive. I am happy with the product thus far. It gives a nice drive without losing definition and has plenty of adjustability. I also like the option to swap out the tube for a different sound. Was looking to try out some pedals to get that vintage tube sound & didn’t want to spend $200, this pedal has done everything I was looking to do! Well worth the money & saved me cash as well! Works as described. But change out bugura tube. This thing is amazing it's like have three channels in a Bugera 1990i. Retired my other pedals. This one blows them all away, and for half the price! first the price can fit almost any budget. 2nd this is fantastic. from warm and fuzzy to full blown atomic melt down distortion. way cheaper than expensive pedals and 3 times the value. its a no brainer must have! I love it and my obsolete overdrive pedals it replaced envy it. This pedal brought a soul into my Blackstar IDCore100 amp. The pedal out of the box was okay, but I replaced the original tube with a Bugera 12AU7 and WOW! On clean channels set the gain low or at zero and turn up the master volume and the notes sing. And with crunch to high-gain settings give it a low gain / low(ish) volume boost and the distortions sound incredible. Everything from my Strat to my ESP 8-string just love it. This Behringer replaced about 6 pedals that now have no use. The quality build and the noise gate feature are a big positive too and the EQ is great (only wish the pedal wasn't huge). Just remember that the balance of the master and gain is what give it a great range of applications. Can't Go Wrong with this pedal even comes with it's own power supply, she is big in sound as well as size. Makes you wonder why you brought all those other pedals??? I like the sound it puts out. I like the 4 different levels.